So my latest task at work is pretty immense, to say the least; not only I am reskinning an entire game in a month's time (2, if you count a month of "pre-production"), but this game is also our most succesful franchise, and it currently features some nicely done non-pixel art graphics. What it all amounts to is a demand for expeditious work of extraordinary quality. Definitely not an easy task. So those who've read thus far, I ask you to join me in this one-month endeavor. To stifle any leaks, I'm not going to mention the name of this game series, but if you happen to know what it is, please don't implicate it. So, with that being said, allow me to introduce what I have done, and give you an idea of what lies ahead. The first bit is the in-game ui. I took some advice and replaced the end turn button with a more consistent font. It's an actual font, because we need a decorative and scaleable font for other aspects of the game. 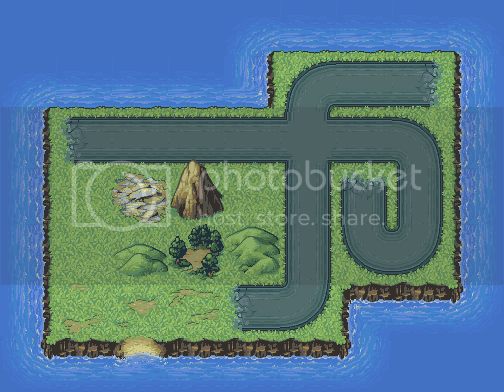 This is the in-game map. Everything but the ore tile (left of the mountain) has been signed off on. These are just the starter tiles, from which variants will be made, but I think that I'm going to try and rework some of the tiles completely. Things that strike me as off are: the rough patches in the grass, the two-dimensionality of the hills, the sparseness of the forest, and the sharpness of the sea tile waves. Although I think that last one could be alleviated when animation is introduced. Anyways, I won't be touching the tileset anytime super soon, but the tile dimensions are 56x56 and allow for vertical overlap, in case anybody wanted to know. These are the units in the game. In all there are over 20 different units. Right now I'm just getting the side-facing of each design signed off on. The Warmachine, condor, albatross, raptor, jammer truck and infantry are all okayed at this point. But improvements are never really frowned upon. 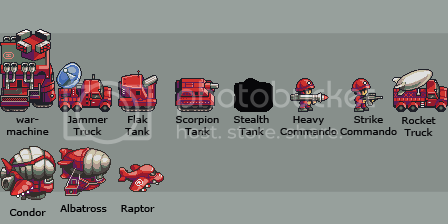 The stealth tank will eventually be an edited version of the scorpion tank, so it's blacked out for now. My weakness seems to be related to tanks and tank-like vehicles. While none of the units are really bad, the scorpion tank and the flak tank fail to stand out as anything special. The rocket truck will probably be getting the empty right triangle of space between it and the truck filled with something similar to that on the jammer truck. Finally, we have avatars. These will be displayed prominantly in the game and will be the primary source of residual income; through the purchase of different accessories, clothing and other such things related to individualization. Because of their prominence, both game and success-wise, it should be evident that it's very important for me to get these right. Both have been signed off on, but I am not happy enough with how either have turned out. A lack of proper anatomy knowledge is a key culprit, and my combining that with a general anime style further hurts it. With that being said, it's important to note that these were signed off on, and my boss quite adores the female base, so any changes you might suggest need to stay within the bounds of what there is, or markedly improve the images enough to go outside those bounds. So that's everything as of now. Keep checking regularly, as the updates for this topic should be coming almost daily. It might be the best one i ever seen, the units are just awesome, as well as the golden and hp/mana bars. Whenever I look at your work, I can turn around and say 'Oh, that's definitely Doppleganger's work'. But for some reason, when I look at this, I wouldn't have believed it was yours unless I looked at the trees. I'm not sure, it may be the time-limit, but something about it seems very... sub-par to me. c: don't get me wrong, it's eons beyond what I could do. I'll edit this post with a critique soon. edit: nevermind. xD Post is below. 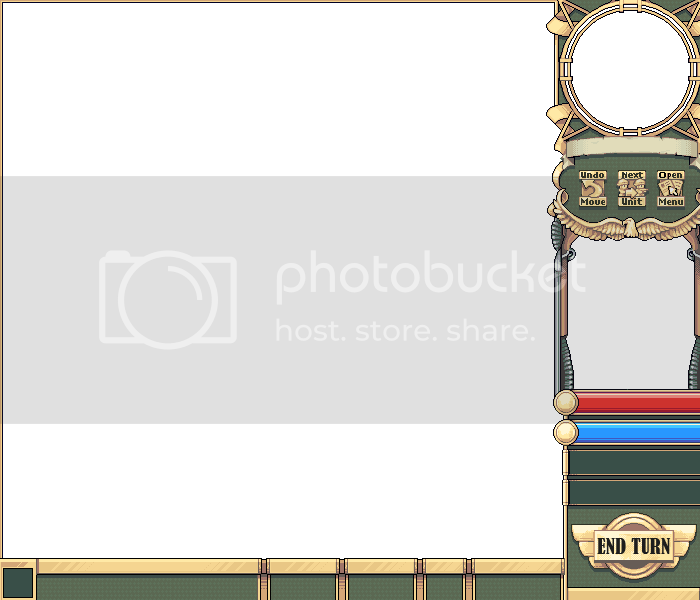 The font in the "End Turn" button is messy. Hell, all the fonts are. But the End Turn one is the most notorious one. The upper caps have thinner lines than the lower caps and also they're on a different style. They simply don't fit with each other. Also, the 3 buttons above (Undo Move, Next Unit, Open Menu) also have font problems. Mainly Open Menu, where "Op" is black instead of green and "p" is in a different font than anything else. 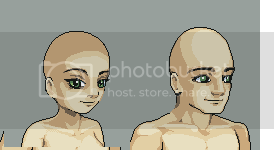 ...Other than that, the female avatar has a HUUUUUUUUUUUUUUUUUUGE forehead. Besides that, everything looks awesome. Congrats. You know the problems yourself: more anatomical knowledge and then a better grasp of where you can stand halfway between a more illustrative style and outright animenes. Also I would suggest against using that greenish tint on the darker shade on the face because green = rot, decay, sickness, doesn't fit for happy anime girl, I think. Check where you connect neck to head, a lot of anime is awful at that too but without neck support your figure will look like a fake head hovering over the face of a real person. Why do you have the lightsource not apply on the top of the head? 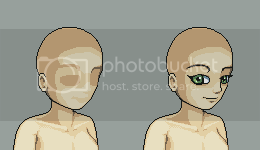 Generally there needs more study to de-symbolicize the effects you use for eyes, noses, mouths here. I am not saying go full out life study here, as you see my version is far away from reality too, but a mouth isn't two lines and a nose isn't made by an angle placed on the head... I know a lot of anime does similar things and when it works it works, but I cannot suggest to you here in good conscience 'work on it until it is good'. 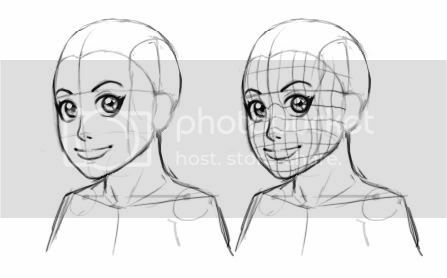 The method I suggest goes through study and replication of more realistic facial features. I hope I helped in any case. -their ears need to stretch down more, usually down to where the neck connects (and lined up with the nose). check the head-neck connection in a mirror or against photos or something, it is tricky. -the man's nose connects a bit oddly - the woman's is suitable but doesn't match his. also, nostrils: i recommend them. Edit: Waitwaitwait why are they all white people again? xD Other skintones exist! 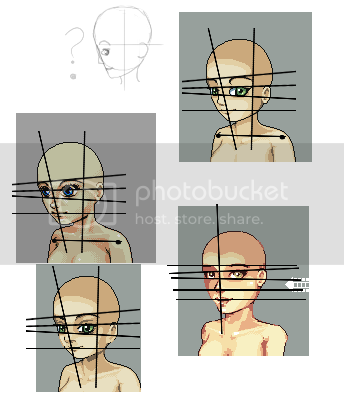 It looks to me like you just pixeled the avatars without doing a freehand sketch first. Am I right? If so, I recommend you do a freehand, referenced sketch FIRST, get everything looking the way you want it, then use that for reference or scan it in and pixel over it. 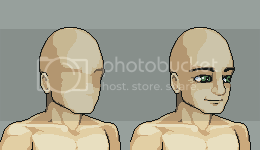 Believe it or not the pro's do not freehand-pixel large sprites. They draw them traditionally and then someone uses that for reference. Look at the avatars in games like langrisser 2 and other anime genre's. Take it from me you will waste lots of hours trying to freehand-pixel line art. This was done in photoshop at 10 x the resolution of your image. Then I shrunk it down and traced over the lines with a 1 pixel brush. The errors in construction remain in the edits, except for evileyes, that's a completely different character. Also wouldn't it be better for the characters to face the battlefield? The base construction suggests the head is level, not pointing down, but the facial features all tell a different story which makes the forehead extremely protruding and the chin way too short. You get used to the errors from staring at a face for too long and i think that's what happened to all of you. I stopped seeing the error from looking at these for just a few minutes. Flipping them really reveals things and lets you see it anew. It's not even about having accurate human construction, just some construction will do to keep it looking like a face. here's my take. I went the same way with evil cause i had trouble doing it in pixel level. I first tried going big head chibi style, but i honestly can't get it right. 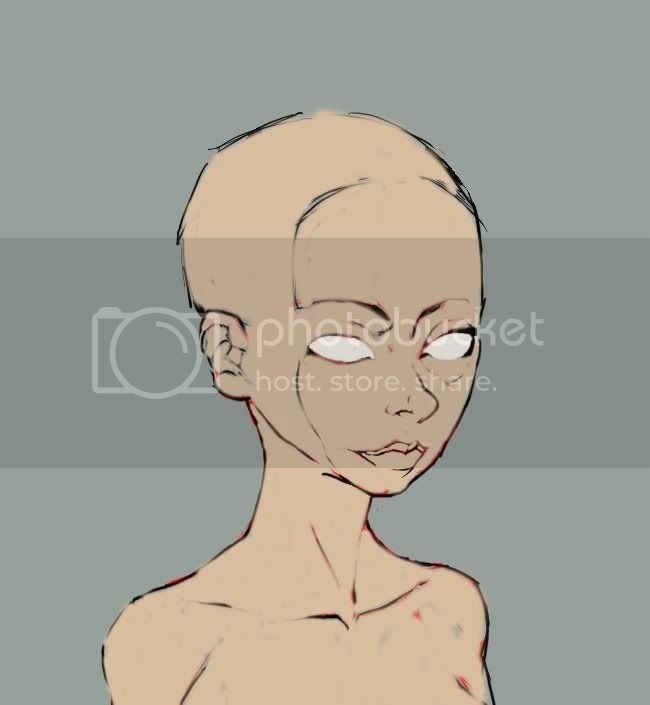 To make the top of the head really big you'd probably have to go eyes wide and low too to get it associated with baby look? I ended up going through one revision with this so I might be blind to it's mistakes already.